In the summer time when the weather is hot, hmmm-hm-hmm-hhmm… Can’t remember the rest of the words! Last weekend was full of picnics, Pimms and polo (I didn’t actually drink any Pimms but it sounded good!) Well, it sounded average. I seem to be suffering from a small case of writers block this week. I was so excited by my Eggs Benedict post that I’ve lost my imagination this week. 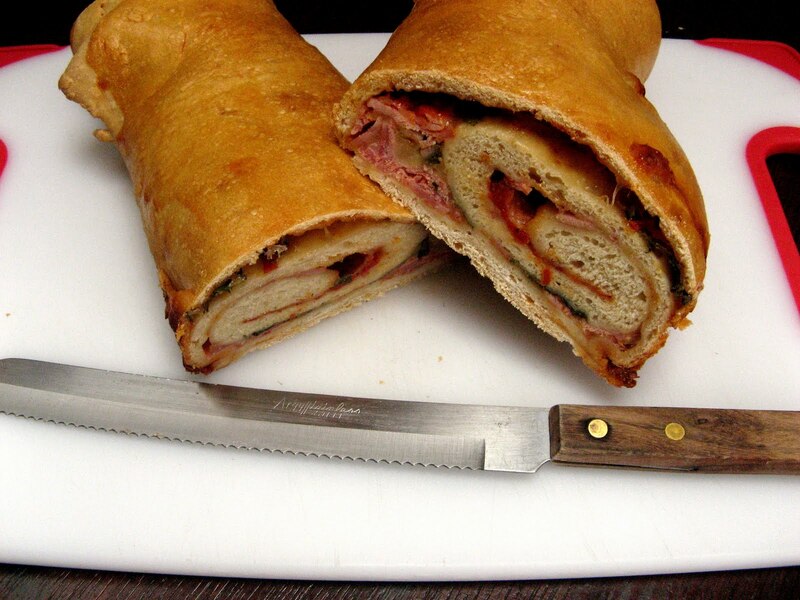 This Stromboli, however, is a fantastic little thing that I found online and is perfect for picnics. Begin by making your dough. All the flour into a large mixing bowl, add the yeast granules and the salt. Also add the Oil and stir it through so everything is mixed up. (The oil will seem like a pretty pointless addition as it’s only one tsp but it makes all the difference). Make a well in the centre of the bowl, pour some of the warm water in and begin to bring the mixture together. Best to try to use only one hand at the start to keep the other hand free to add more water. NOTE: If the mixture is crumbly add a bit more water, if it sticks to your hands add more flour. You MAY not end up using all the water so don’t feel that you HAVE to use it all up to make mud pies! Place the kneaded dough back into the mixing bowl and cover with a lightly oiled piece of clingfilm (just place it on top of the dough – this is not to seal the bowl with…. Leave the bowl in a warm place to rise for at least 2 hours, it will end up double the size and will smell gorgeous! Knead the dough again and once again leave to rise for another couple of hours. 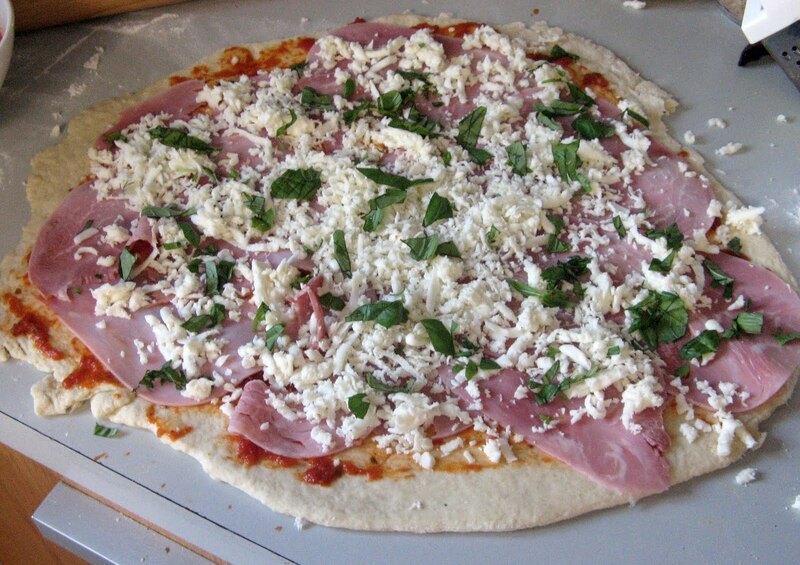 Add the tomatoes, ham, grated mozzarella and fresh basil. Black Pepper. Roll up and place on a non-stick baking sheet (large one) or some baking parchment if like mine, your baking sheets are so old they aren’t non-stick anymore. Crack the egg into a cup, give it a quick whisk and brush the dough with the egg wash. Pop it in the oven for around 25 minutes. It’ll come out looking golden brown and scrumptious! BEWARE – HEALTH AND SAFETY!!!! The inside will be so so so hot, so if you don’t want a furry tongue for a week, leave it to cool for a little while! Once it’s cold cut it up as you would with a baguette and serve to the ravenous picker-knickers! Goes well with a small dollop of Hellman’s! 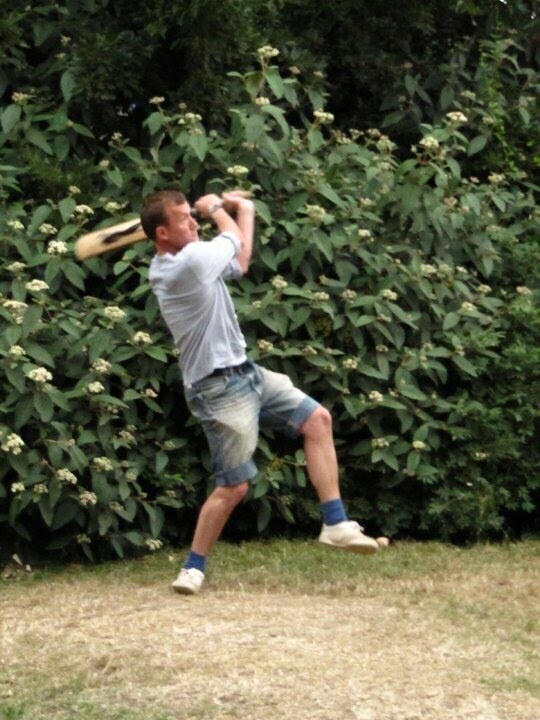 Warning to those with dentures – the ends are a little hard – the boys played cricket with one of the ends!! The rest of it is blooming gorgeous! Mmmmm… sounds yummy. I like the summer recipes, keep them coming! Thank you! I'll do my best to keep 'em coming!Think my housemate thinks i'm a bit odd taking pics of all our food! !